DealExtreme was opened in 2006 and managed to gain a good reputation from customers all over the world. Its main advantages are low prices and free delivery of goods throughout the world, regardless of the cost of the order. All orders are sent from Hong Kong. 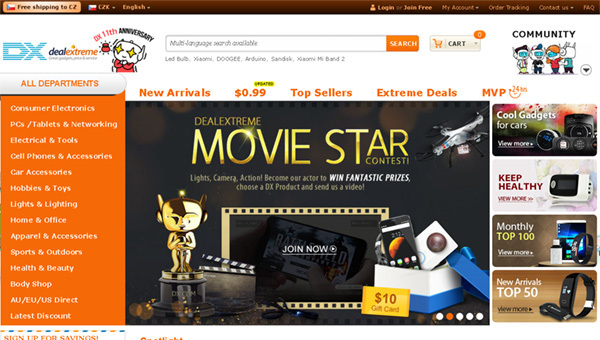 DealExtreme is probably the most popular Chinese shop on the Internet. The main assortment of the store is smartphones, tablets, and other electronic gadgets. The delivery time of the order is about 30-45 days from the date of dispatch, depending on the destination. DealExtreme has a small percentage of defects of their products. Also, they have one of the best technical support. For shopping, it is recommended to register on the site, but it is not necessary. Before buying a product it is strongly recommended to read reviews. You had better beware of products if there are no feedbacks, especially if they are very cheap. Delivery for all orders throughout the world is completely free, regardless of a number of goods ordered and the cost of the order. A free tracking code is given for orders over $15. Orders with a total amount of less than $15 will be shipped by airmail without tracking code. But you still can add tracking code. It costs $1.70 for such orders. You can also choose express delivery service - EMS. For some expensive products, express delivery is a required option. You can return the goods of decent quality within 30 days after receiving. You will be paid back all money except the cost of delivery. Requirements for product returns: original undamaged packaging, preservation of the original form of goods, full set. In this case, you have to pay for delivery of the goods back to China. The damaged goods will be asked to send back if the cost of sending (it is refunded) is less than 30% of the purchase price. Otherwise, DX could send a new product without even asking to send damaged goods back. If you received a defective item, DealExtreme takes it back with full compensation. Requirements to return are the same: original packaging, complete set, preservation of the original look. At the most items represented in the catalog, there is a factory warranty (mobile phones, laptops, GPS navigators, etc.). The warranty period is listed on the page with a description of the goods, but it does not exceed one year. Remember, the warranty does not cover power supplies, batteries, wires, cables, adapters, chargers, headsets, etc. I once bought 2 earpieces,wireless headphones n wrist watch from Dx but I only got wrist watch since from early June till now n I only having order number not track number n in soo hate their service Bcoz I thought they were the best but even today I see nice things from them but I can't risk again never never!!!!!!!!!!!!!!!!!!!!!! From they I have my brand new phone! I have used DealExtreme for over five years. I quickly adapted to the fact that their items can sometimes take eight or nine weeks to arrive, and simply made sure that I ordered items that were not urgent. From dozens of orders, the occasional one failed to show up within ten weeks, and their customer services immediately resent the same SKU as soon as I contacted them. On May 23rd I got the parcel of 3 products, one of them was aluminum LED strip at 16W. After I connected it, it worked only for 10 seconds and went out! I wrote complaint on their web-site and they offered me to send this item back at my own expense! And the most important thing is that I need send it not to China (from where it actually came), but to the UK. As a result, the price of shipping is $30 and the initial value of the goods was $18. After I refused to send it back, they just ignore my further treatment! That's awful!!! About advantages of the store has been said a lot. I'll tell you about the shortcomings:1. They send out goods in the soft box. Even if you order a large quantity of goods. 2. They don't have a big desire to return the money for defective goods. Also they don't want to send another thing instead of defective goods. They offer only a part of the cost to compensate for the broken item. Prices for small goods are much higher than prices of their competitors! Prices here are often higher than the prices of their competitors. Perhaps this is due to its reliability. As for me, DealExtreme is the most comfortable Chinese shop.